5. Who Do You Think You? 1982 was to prove one of After The Fire’s busiest years since signing to CBS Records in 1978. With three major support tours with ELO and Queen in Europe and a mammoth trek around the US and Canada opening for Van Halen it is extraordinary that not only did they record and mix their worldwide hit ‘Der Kommissar’ in between all this ‘hectivity’, they also booked Eastbourne’s ICC Studio 2 to lay down ideas for their next album ‘AT2F’ However the band split up in 1983 and the album was never released until now. Mixed back at Peter Banks’ own studio these are the results, capturing what the band did best, playing live and enjoying themselves! 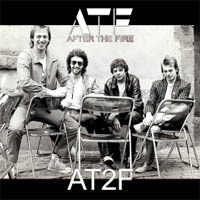 This is ATF at their classic best, with their 80s lineup of Peter Banks, Andy Piercy, John Russell and Peter King. Energetic, powerful, no messin' — an album to keep playing and to pump up the volume on… 80s new wave at its best. Overall, if you bear in mind that this is simply an interesting curio with patchy sound quality, it'll appeal to established fans of the band who wondered what might have happened next.